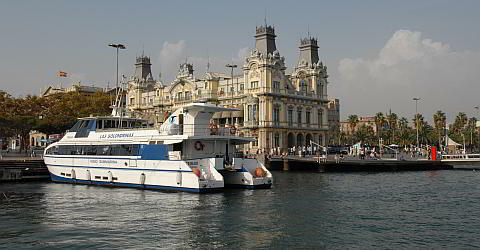 Here you can book a 1.5 hour voyage with the Golondrinas along the coast and the beaches of Barcelona. You'll see the most important buildings that make up the city skyline. The tour is highly recommended, and is perfect as an entertaining outing with kids. Enjoy the ride on the boat with soft drinks or a glass of wine while giving your feet a rest. The voucher is valid for one full calendar year. The ships are double-decker catamarans. Outside on the upper deck you can enjoy the wind and the sun. The lower deck is furnished with tables, chairs and a bar. You can get into the boat hull via a staircase. There you can see the sea rushing past through panoramic windows below the waterline. January, Monday to Friday: 12:30; holydays: 12:30 and 15:30. February and March, daily: 12:30, 13:30 and 15:30. April, May und June, daily: 12:30, 13:30, 15:30, 16:30, 17:30 and 18:30. July, August, September, daily: 12:30, 13:30, 15:30, 16:30, 17:30 and 18:30. October, November: 12:30, 13:30 and 15:30. December, Monday to Friday: 12:30; holydays: 12:30 and 15:30. Please arrive about 15 minutes before the departure of the boat. In order to ensure a safe voyage, the boat may not depart for safety reasons in bad weather such as storms or heavy seas. The pier of the Golondrinas is located about 100 m away from the Columbus monument at the end of La Rambla. The Online-Booking is very easy: Enter the number of people for whom you would like to book a place on the ship in the booking box on the top right of the page. Immediately after booking you will receive an e-mail voucher that you can print out and simply bring directly to the ship. The voucher is valid for the entire calendar year for one-time use, you can use it for any departure. You will receive directions together with the voucher after booking. Plans can change: You may cancel your reservation free of charge up to 31st December of the current year, if you have not yet redeemed the voucher .